1: Thieboudienne- Made with fish, rice and tomato sauce, and may also include onions, carrots, cabbage, cassava and peanut oil. 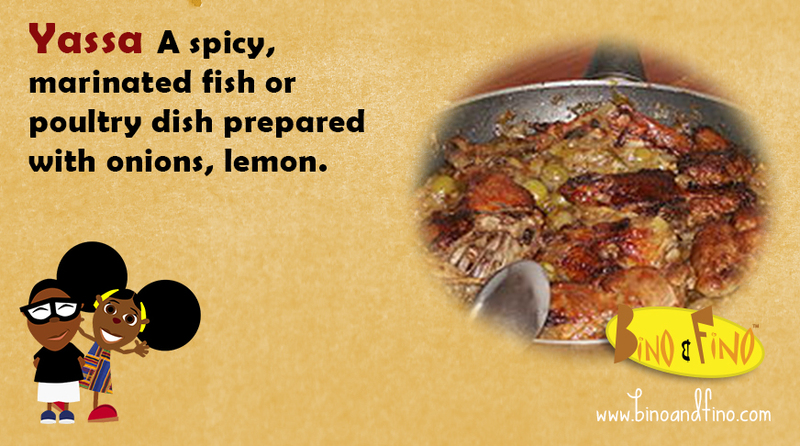 2: Yassa - A spicy, marinated fish or poultry dish prepared with onions, lemon. 3: Jollof also called 'Benachin' meaning "one pot" in Wolof, it is a popular dish in many parts of West Africa. It said to have its roots in Gambia. 4: Domoda – Is a delicious peanut stew consisting of usually pumpkin or sweet potatoes and a saucy base. 5: Superkanja – a mix of okra, fish or meat, onions and peppers boiled together. 7: Katxupa – is the national food of Cape Verde. It is a vegetable stew with root vegetables, beans, meat or fish. It can be eaten with a fish filled patty called pastels as well. 8: Fish calulu is a typical dish from Angola and São Tomé Príncipe. 10: Fig roll – An ancient Egyptian pastry, filled with fig paste. 11: Kelewele – Fried plantains seasoned with spices from Ghana. 12: Mandazi – A fluffy fried bread snack that is popular in East Africa. 14: Nigerian puff puff – Sweet spongy, deep fried snack from Nigeria. 15: Koeksister - A South African syrup-coated doughnut in a twisted or braided shape (like a plait). 16: Romazava is considered the national dish of Madagascar, and each family makes their own version. It is a one-pot dish, usually eaten with rice for lunch or dinner. 17: Dholl puris is the most popular food in Mauritius. It is a fried thin bread stuffed with ground yellow split peas, and served in a pair with bean curry, atchar and chutney. 18: Funge – Is a popular side dish in Angola. It is a paste or porridge made out of cassava. 19: Rougaille is a popular Creole dish which is a tomato stew – particularly made with meat or fish, tomatoes, garlic, onion, and thyme. 20 Kenkey – A sourdough dumpling this is usually eaten with soup, stew or sauce.